But while it all works well for Mo and the event to go just half-way in London 2013, how fair is it to the actual race contenders? And what does it do for the focus of race coverage? Before the Mo announcement, London 2014 had already been touted as having the best field in its illustrious history. Four former champions had been signed along with six of the ten fastest marathon men in history and reigning Olympic champion Stephen Kiprotich of Uganda. Now all of a sudden Mo is the main attraction, and the best field in history is relegated to very well paid tutors. And why not? Because as fast as the others may be, none of the main contenders would be recognized from Adam walking down a London street like Mo Farah would. And you can bet their appearance fees reflect that difference in star wattage, too — but only in comparison to Mo. They are still being paid way above what other marathons can afford, perhaps in the $200-$300,000 range by some estimates. But how much sense does it make to recruit the greatest marathon field in event history and then trump it by bringing in an “also ran” as the highest paid and most celebrated athlete in the field? Mo is a huge personality in the U.K. No matter where he situates himself in the lead pack he will create an energy field. You can already see the fruits of this signing blooming in next year’s negotiations. The financial discrepancy between Mo and his mates could even have consequences this year, as well. Farah’s presence will understandably draw the spotlight away from the Wilson Kipsangs, Geoffrey Mutais, and Stephen Kiprotichs. It can’t help but do so. At the same time, while it makes sense for the London management to capitalize on Mo’s star power, is it fair to the men making this year’s race their entire spring focus? While it’s been a far-gone conclusion that Mo would make his debut in London, there is potential downside to signing him to the biggest appearance fee in the field after all the other negotiations had been finalized. The ‘real’ marathoners might feel slighted, or used. Ethiopians can be particularly sensitive to such matters. The marathon is tough enough as it is, and you want the athletes to feel an emotional connection to the event, then make their money running their asses off. Mo’s Million could upset that emotional connection. But it’s funny, too, how motivation can work both ways. Recall that when Ethiopia’s Haile Gebrselassie made his marathon debut in London 2002 the anticipated match up was against his great Kenyan Olympic track rival Paul Tergat. London also invited — for significantly less money — the reigning marathon world record holder Khalid Khannouchi of the U.S. At the time everyone assumed that Khannouchi was past his freshness date, and had been invited so the current world record holder would be on hand to see his record taken down. Instead, Khannouchi got pumped up by everyone writing him off, and whipped both Geb and Tergat in a new world record (2:05:38, still the standing American record). Or, how about the case of Meb Keflezighi at the start of the London Olympic Marathon where they announced ten runners to the crowd, including American Ryan Hall, but not Meb. Meb is standing there thinking, ‘I’m the only Olympic Marathon medalist in the field and the U.S. Olympic Trials champion, and I don’t get mentioned?’ He took that slight to heart and then to a strong finishing fourth place. Maybe the Mo signing is ingeniously Machiavellian. Let’s see who feels the spur in London 2013. 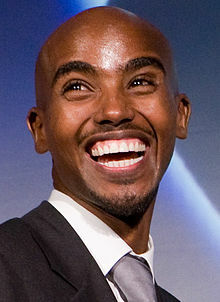 Inviting Mo Farah to run half of this year’s London Marathon is a new twist on an old saw. When John Hancock Financial Services began sponsoring the Boston Marathon in 1986, and inviting its elite fields, they introduced the first multi-year deals into the sport, as well as the first restrictions on where else an athlete might run within the Boston calendar window. The New York Road Runners began seeding its races in 2005, the first year Mary Wittenberg took over as CEO. Dathan Ritzenhein was the first athlete to take a ride in the NYC lead vehicle, followed by Ryan Hall, Kara Goucher, and Shalane Flanagan and Desi Davila. These days two or three prospects ride in the press truck each year. The practice has proven quite successful. It evidently works both ways, though, as Bernard Lagat took the ride two years ago, and came away thinking, hold on a minute, that looks pretty hard. However, that ride was not lost altogether as “Kip” will be making his half-marathon debut in NYC this March 17th. Is it really very interesting to watch an athlete even Mo Farrah run a race that he has no intention of finishing? I don’t get it.